Inspired by true historical events, this middle grade adventure novel weaves history together with mythical creatures and memorable characters to create a highly entertaining story. Though this is Engle’s debut novel, she handles story like a pro, barely giving the reader a moment to catch breath before leaping off into new twists and turns. Readers who enjoy middle grade adventure stories will not be disappointed in this charming and exciting adventure. Tagged Clifton Chase and the Arrow of Light, Fifteenth Century England, Jaimie Engle, Time Travel. Bookmark the permalink. Thank you for an awesome review! Be sure to check out my blog under the REVIEWS tab to see a link back to your website. Good luck to everyone who enters!! Seems like a book that the professor would read! Oh no! Are you on Twitter? Are you following Jaimie Engle? – I’ll have to check with the author, but I feel like that’d probably be an acceptable substitute. Yes, I do have twitter. Congrats professor! You win the giveaway! 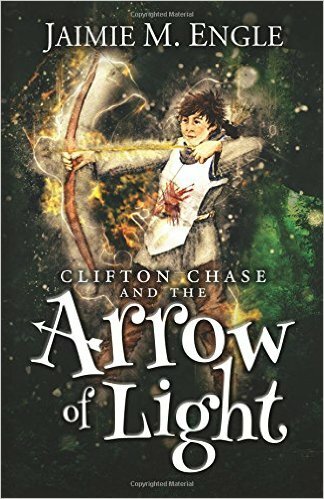 Please let me know if you prefer to receive an ebook or hard copy of Clifton Chase and the Arrow of Light. Yay! A hard copy definitely! And thanks!